​NISHINAKA Yukito is about to create yet another new universe with his glass artwork. A meditative space with glass pillars in various sizes will spread before your eyes; it will be a place which will free your senses and perspective, and which will invite you to a world of imagination. ​What would this space show you? 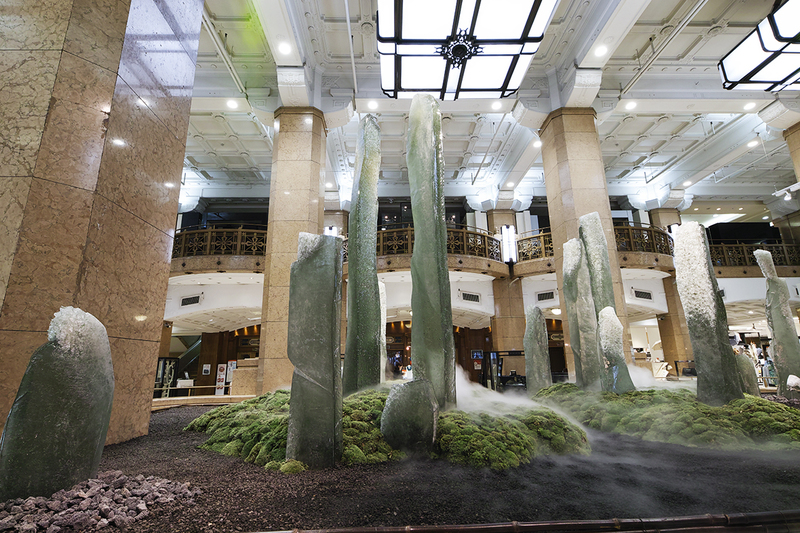 You may see sculptures of light, or a kare sansui, a dry landscape garden based on the Zen concept. The vast universe or a utopian world might appear before you. It may remind you of ancient myths, or make you dream toward the future. Tranquility and elation, life and death are also what could be perceived. The artist invites you to spread your wings of imagination with your instinct as your guide. 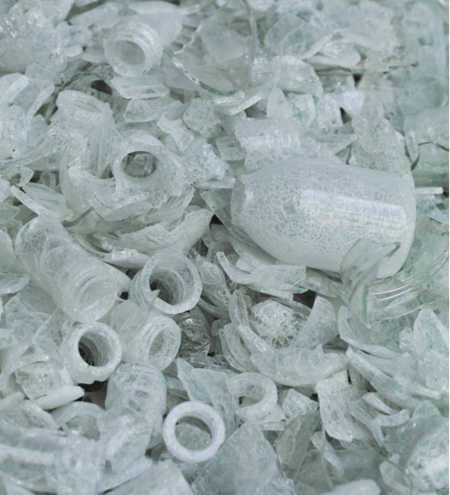 ​The recycling rate of glass is 70 percent, a fact unknown to many people. By pure coincidence, the same figure applies to an aspect of the Earth—70 percent of its surface is covered by water. 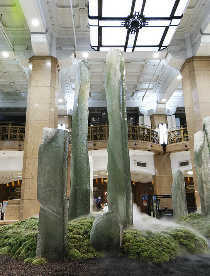 As water circulates between the lands, rivers, and oceans, glass goes round human society by being consistently reused. ​The glass used in the artist’s meditative space is, of course, recycled glass. This project was born from the collaboration between Nishinaka and Nihon Taisanbin Glass Bottle Mfg. Co. Ltd., a leading company in recyclable glass. 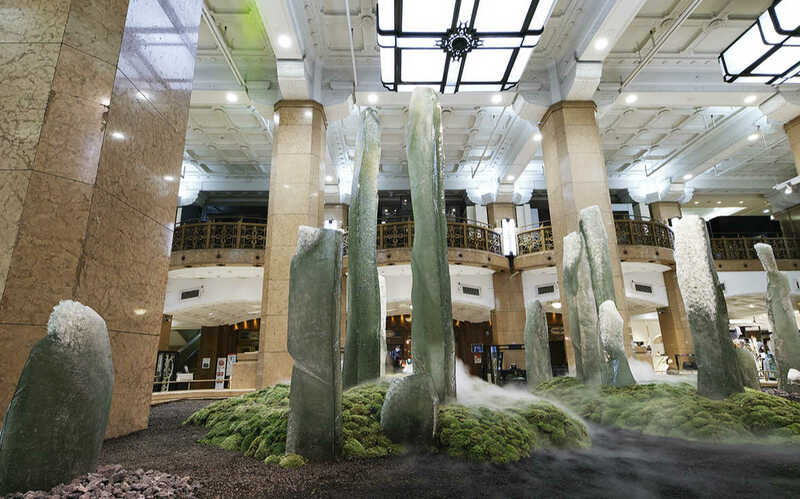 The fusion of art and cutting-edge technology has created a space where it welcomes people to contemplate about a society based on recycling natural resources. This exhibition is not just about recycling glass bottles, but is also a realization of upcycling, where the artworks themselves speak out on environmental issues. ​Exactly one hundred years have passed since Marcel Duchamp upturned the art world at an exhibition by presenting a “readymade” object of a urinal named Fountain. It was from around this time that he began working on his complex piece The Large Glass. This artwork was damaged when being transported, but Duchamp is said to have remarked that the fractured piece looked better than before. This reminds us of the fact that the Japanese sought beauty in broken and damaged parts from several hundred years ago. Nishinaka is an artist who also seeks to show both the transience and strength of life in the imperfective beauty of broken glass. ​“As glass breaks, so people die: nothing is eternal, so live the moment.”—this is exactly how Nishinaka has lived his life. Compared to the long history of the Earth, human’s lives are just a fleeting moment. But the power of art is how it shows a glimpse of eternity in itself. Nishinaka’s new meditative space is where people can experience eternity captured in a moment.